Sometimes it seems like there’s nowhere to hide. Equity investors were smacked in the face over the month of October, with waves of selling hitting sharemarkets from Sydney to Shanghai and London to New York. Something like $7 trillion was wiped off the value of global sharemarkets. 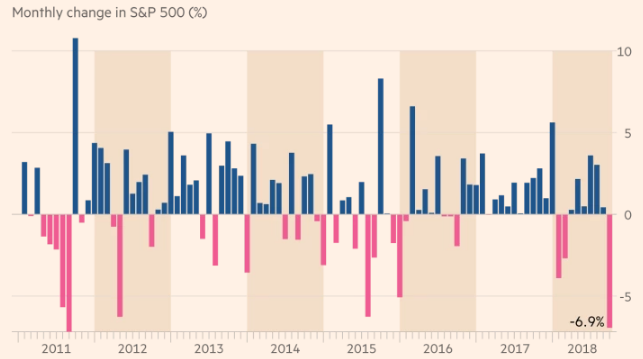 Tighter financial conditions, trade wars, geopolitical concerns, high valuations and general uncertainty have drenched investor confidence and erased year to date returns. What is going on? Is it time to run for the hills and avoid this financial tsunami? It was a tremendous couple of years in retrospect. Look at the blue line above tracking the global share market (MSCI All-Country World Index) - steadily rising through 2016 and 2017, with practically no setback, no correction, barely a blip. Of course, it was too good to last. 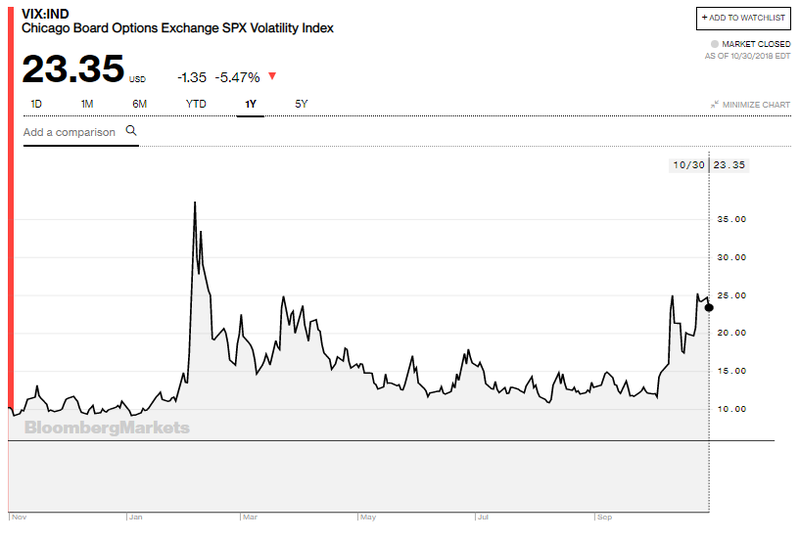 And since the beginning of 2018, there has been a return to more normal trading patterns, with volatility up, the economic data mixed at best, and share prices on a roller coaster. At the start of calendar 2018, investors were filled with optimism: we anticipated a return to synchronized global growth, interest rates were highly accommodative, and we had enjoyed 2 years of strong share market advances without a stumble. Most of the world’s good economic and financial news came from the United States, including robust economic growth, a buoyant job market and inflation still very much under control. While disconcerting to many, political dramas in Washington proved little more than distracting noise, and trade conflicts had yet to bite. The S&P 500 Index reached new highs and corporate earnings rose on vigorous business conditions and tax cuts. But October changed the mood and volatility rose and stocks and bond prices fell in a re-run of February’s turmoil. October has been the worst month in recent history for the S&P 500. The central question for many investors through to the end of this year will be the path for US interest rates in 2019, with most expecting the Federal Reserve (the Fed) under Chair Jerome Powell to continue gradually tightening policy. Complaints from the President (“Tightening now hurts all that we have done”), falling sharemarkets and rising trade tensions seem unlikely to slow the Fed’s current pace. On the other hand, any further inflationary pressures from, say, a surge in wage growth or higher oil prices could give the Fed reason to increase rates faster than expected. Even if the Fed doesn’t move to lift rates in December, as the market expects, it is on the path of reversing its Quantitative Easing program. It is steadily reducing its balance sheet assets, and this is increasing the supply of bonds, and thereby putting upward pressure on bond yields. The total size of the Fed’s balance sheet (i.e. the value of the securities it holds) remains enormous and historically without precedent. But it is the flow, or the change at the margin, that generally matters more than the amount of bonds that the Fed is holding. 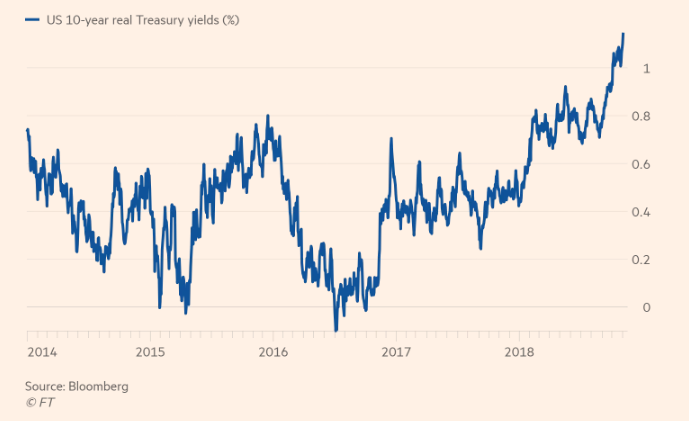 And over the last year, the Fed has tightened as much as it eased previously by reducing its Treasury holdings “in a gradual and predictable manner”. Trade frictions between the US and China have been unsettling. Commentators have tracked the lengthening lists of goods that the United States and China began subjecting to tariffs. While President Trump signed revised trade agreements with Korea, Mexico and Canada, the tensions with China continue and appear to be more about geopolitics than economics. Vice President Mike Pence’s remarkably aggressive China speech at the Hudson Institute on 4 October makes frightening reading. 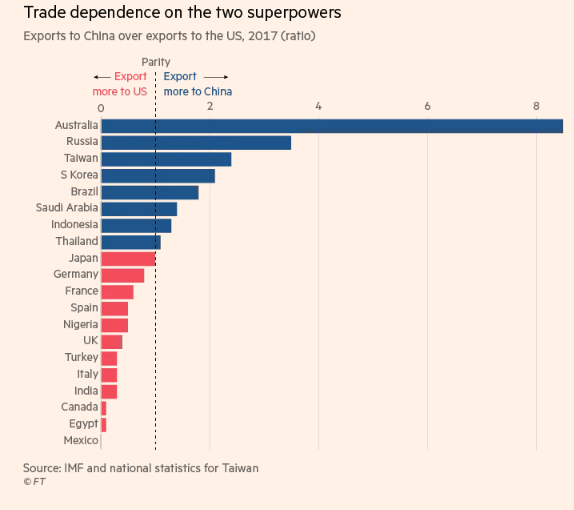 It remains unclear just what concessions from Beijing might be enough to appease Mr Trump amid a range of US complaints around the trade deficit, intellectual property theft and government subsidies. Chinese stocks have been in steady decline for months, down 27% since their January high. Although China’s economy grew at 6.5% in the third quarter, this is a long way off the almost 10% average growth China has experienced over the past three decades and is the slowest growth rate since 2009. There is also the small matter of a trade war with the US, and regulatory, monetary, and economic challenges at home. 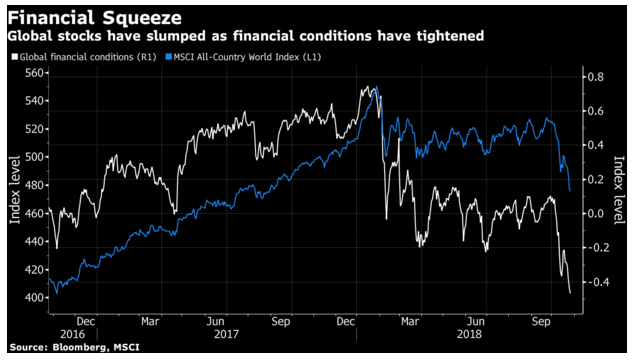 This year’s stockmarket rout in China has eliminated roughly $3 trillion of market value, bringing the Shanghai Composite Index down to levels of 10 years ago and ranking it among the worst-performing markets this year. The trade dispute with the US is part of the problem, but by no means the only one. China has been engaged in a balancing act, trying to tame its shadow banking system and transition from an export-oriented to a consumer-oriented economy; it is also trying to clean up its environment while not closing too many manufacturing and heavy industry plants. All this needs to be achieved without slowing overall economic growth too much, and without creating further unemployment. This transformation has gotten tougher as rising US interest rates and a stronger dollar give China less flexibility to offset the pain from external shocks — like an unwelcome trade war. Large US multinationals like Caterpillar and 3M have already cited the impact of US-China trade tensions on their businesses. Such earnings reports remind investors that China’s problems can quickly become the world’s problems: China is the world’s third-largest importer, integral to all manner of manufacturing supply chains, and the biggest consumer of autos, copper, and iron ore. And, of course, Australia’s biggest trading partner. 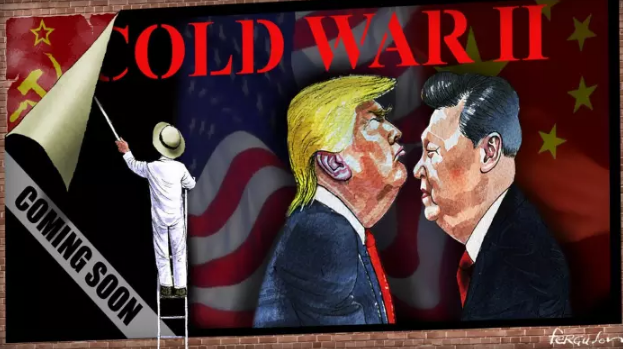 China is facing numerous issues that are increasingly complex to cope with, not least the trade war, rising interest rates in the US and belligerence concerning its currency manipulation. In addition, Beijing is pursuing several reform efforts, such as regulating companies in the shadow banking sector. This has resulted in consumers spending less, as many rely on these alternate sources of credit. As an example of the flow-on effects: auto sales in September fell nearly 12%. China’s stimulus measures have to date been less effective than previous programs. Beijing has eased monetary conditions and increased lending, proposed income tax cuts, and may offer a rebate that covers a value-added tax, but it hasn’t helped much yet. Policy makers have been taking a more measured approach, aimed at stimulating consumer spending, rather than the old approach of a big stimulus package that pumped money into infrastructure and fueled a debt binge — and that’s a good thing. It also makes things harder. Other risks loom. Some 10% of mainland Chinese shares, also known as A shares, are used as collateral for loans — a possible danger as the economy slows. Some of the risk is factored into the A-shares prices, which are denominated in renminbi, and regulators have created a fund to support companies at risk. Any negative news, however, could create another wave of selling. Chinese exporters could fare worse in the future. 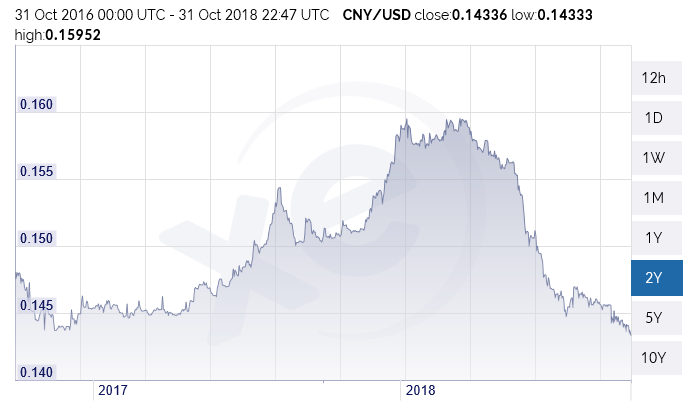 The renminbi neared its weakest point against the dollar in a decade, down 6% for the year, which has helped Chinese exporters cope with the 10% tariffs imposed by the US so far. But those tariffs are set to rise to 25% in January. 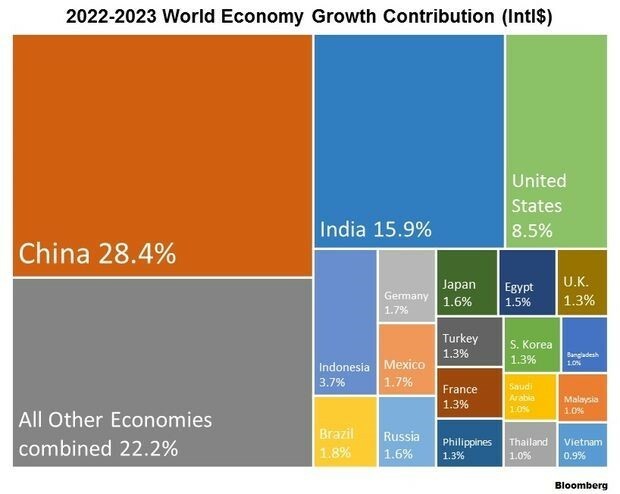 An all-out trade war would cause global growth to slow but would probably hurt China far more than it would hurt the US. One potential long-term beneficiary of a trade war: Southeast Asian countries, like Thailand or Malaysia, as companies begin investing in new production capacity there. The risks facing China’s economy and markets suggest that the environment could stay bumpy and uncertain for a while yet. That does not imply we are not believers in China’s long-term outlook – we are. Consider Xi Jinping’s comment on 5 November in his speech opening the China International Import Expo: “In the coming 15 years, China’s import of goods and services are expected to exceed US$30 trillion and US$10 trillion respectively.” Australia must ensure that it participates as fully as possible; it will need to engage in delicate and nuanced diplomacy in order to retain good working relationships with both Washington and Beijing. It may take a while before the dust clears and the path forward becomes visible. Germany will be looking beyond Angela Merkel’s 13 year leadership as Chancellor and de facto leader of the European Union. She has indicated she will step down from the CDU and retire in 2021 but will probably not last that long as Chancellor. The transition over the next couple of years is bound to be traumatic, with Merkel the bastion of a liberal world order during a time when voters are choosing to turn instead to right wing populists. Europe seems somewhat rudderless and stuck in the mud, with solid corporate earnings on the one hand, but rising jitters around Italy’s new populist government and the possibility of an ugly end to Britain’s membership in the European Union. Higher US interest rates and lackluster European data drove the US dollar higher in July and August at the expense of most emerging markets (EMs). Volatile and falling commodity prices have added to the pain being felt by EMs, and many have been beset with political dysfunction. Russia, Turkey, Argentina and South Africa have all faced crises of confidence and worsening economic conditions, while joining the trend, Brazil welcomes a new far-right populist president in the form of Jair Bolsonaro. Time to look at your Asset Allocation? There are two quotes that the author read recently, and that spring to mind in assessing the investment environment and asset allocation decisions. The first is from John Authers, the highly regarded FT columnist who recently transferred to Bloomberg. “We can only reach the long term by first surviving the short term”. And the second is from Edmund Burke, the 18th Century British philosopher and political theorist “You can never plan the future by the past”. When investors look at the past to prepare for the future, they must contemplate how its lessons will, and won’t, be relevant in the years ahead. That is not an easy task. We look below at some of the factors which have de-stabilised markets of late and assess whether it is time to alter asset allocations in response. Of course, financial circumstances differ across readers and you should treat this information as general (not personal advice). Perhaps a good place to start is looking at asset class returns over various time periods and seeing what we can learn from that. 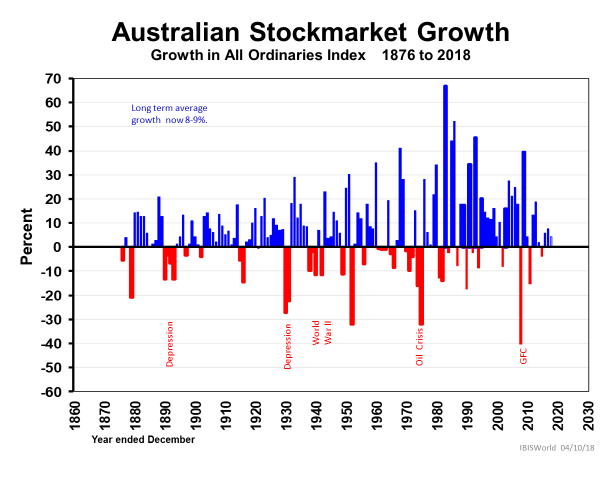 Since 1900, the Australian sharemarket has had 95 positive years versus 22 negative years, or a ratio of 4.3 to 1 in favour of a positive return. But as we can see from the chart above, the negative returns can be very ugly, such as the 40% drawdown in 2008. Here the picture has changed somewhat. 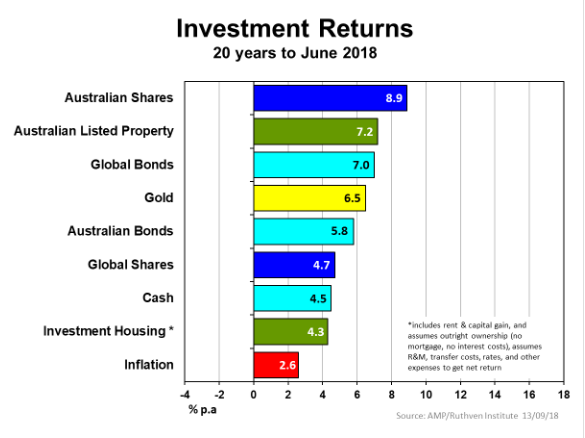 The returns on Australian shares have fallen markedly – from top of the chart to third, and a significant 3.5% per annum below international shares. The recovery from the GFC has been less pronounced in Australia than it has been in the US; this is also reflective of the composition of our index (being heavily weighted to financials and materials, and light on IT, Pharma, Defense). Note that Bonds have performed more or less in line with Australian shares yet would have experienced far lower volatility. 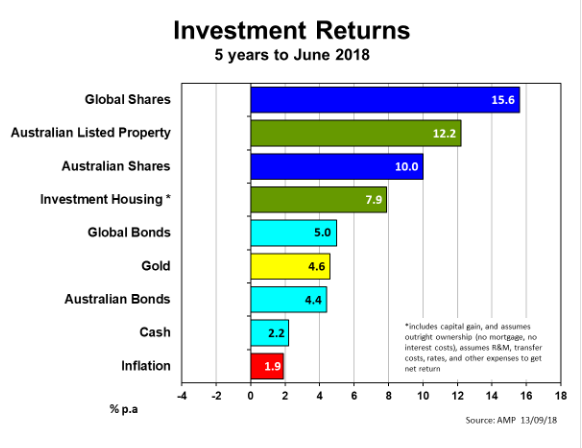 We note how global shares have streaked ahead, partly driven by the 24% fall in the USD (from US$0.95 in Nov 2013 to US$0.72 today) and followed by the stellar performance of the Australian listed property sector. It is further noteworthy to see how inflation has steadily declined, averaging 2.6% over 20 years, 2.1% over 10 years and 1.9% over 5 years. This tends to support our view that official interest rates in Australia will not be increased by the RBA anytime soon. Over the last 5 years, Australian bonds have returned only half that of Australian shares. We acknowledge how difficult it is to make predictions about how markets will behave. We return to the historical evidence over decades as a useful approximation of what patterns we might expect in the future – except we know that history doesn’t simply repeat itself. Smart investors ensure a spread of investments across the asset classes, and diversify across risk, time, security and geography. In times of high uncertainty, it is worthwhile retaining larger than normal levels of cash which can cushion volatility as well as be a source of funding for exceptional opportunities. As noted above, the key driver of global markets at present are US interest rates and the growing likelihood of tighter financial conditions. QE (quantitative easing) in the US has ended and QT (quantitative tightening) has started. 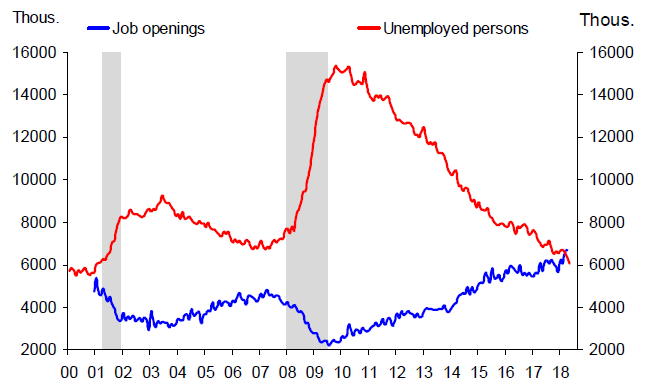 We bring to your attention two charts below which highlight issues driving rates and markets: the first is the extremely strong jobs market in the US, which will drive wages growth (eventually) and thereafter inflation. This will be followed by an increase in interest rates by the Fed as it “normalizes” post the GFC. And the second chart shows the yield on US equities is becoming less attractive compared with the 2 year Treasury yield. A theme of the US market in 2016 and 2017 was “TINA” (“There Is No Alternative” … to investing in equities, because yields on bonds were so low). 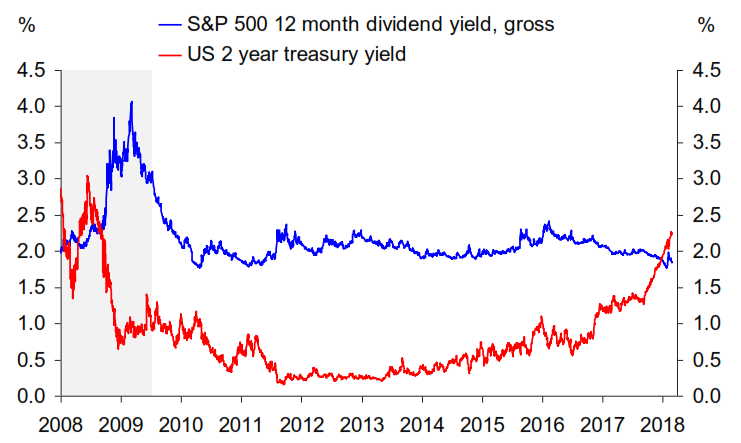 Now there is an alternative, with Treasuries yielding more than the dividend yield of the S&P500 for the first time in 10 years. Investors have noticed and have begun the asset allocation switch. The International Monetary Fund said last month that it expected the steady expansion in the world economy to continue into 2019 but warned that growth might have peaked in some big economies. Rising concerns over tariffs, global growth and potentially peaking corporate earnings have hit markets around the world. We face uncertainty across multiple fronts. US midterm elections will be held on Wednesday 6 November. Although his name is not on the ballot, the elections offer US voters their first chance to either rein in President Trump or to give him a revived mandate. The outcome might surprise the US stock market and create another week or two of roller coaster prices. Great read. We have an asset (debt) bubble driven by QE and free money. This is reversing now. AA is more important now that in the last 10 yrs. Stay safe. 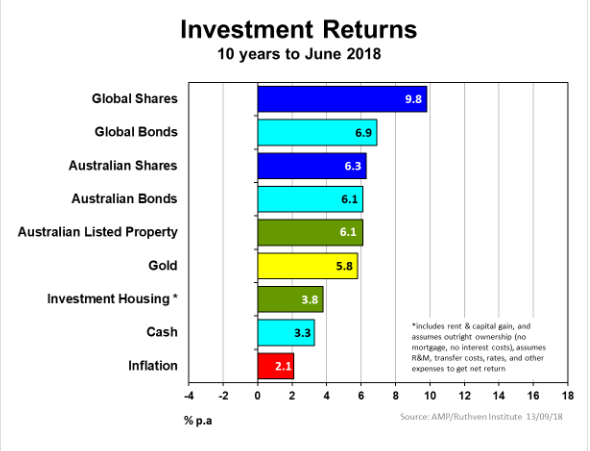 Australian returns over 10 years though are virtually nothing. We are at 2006 levels, index investing in Australia is extremely risky. Definitely an interesting time. Great article. You have covered all the bases and set them out very clearly. Great road-map for investing and protecting capital in a volatile environment.